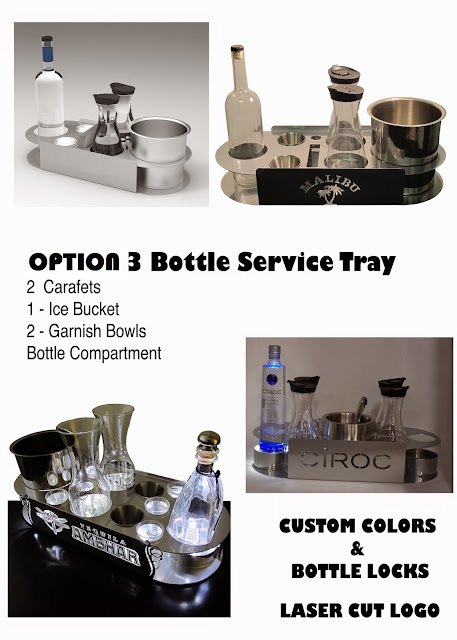 CHECK OUT BELOW, OUR LARGEST BOTTLE SERVICE TRAY NOW AVAILABLE, CUSTOM MADE AND DESIGNED FOR "HARD ROCK CAFE"
The OPTION 1 Tray creates an organized centerpiece setup designed to highlight and promote your services while enhancing your Patrons Bottle Service Experience. 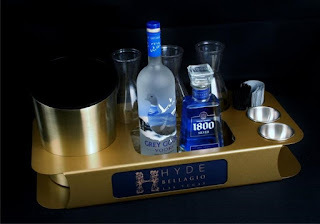 Designs are available in Locking and non-locking styles, and these Custom VIP Trays are made of high resistant steel, polished or powder coated colors. 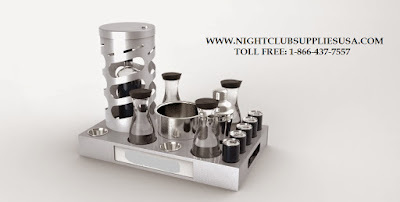 NightclubSuppliesusa.com is the innovator and the ultimate source when it comes to bottle service sets, and they make a bold statement when serving a drink or promoting your brand. 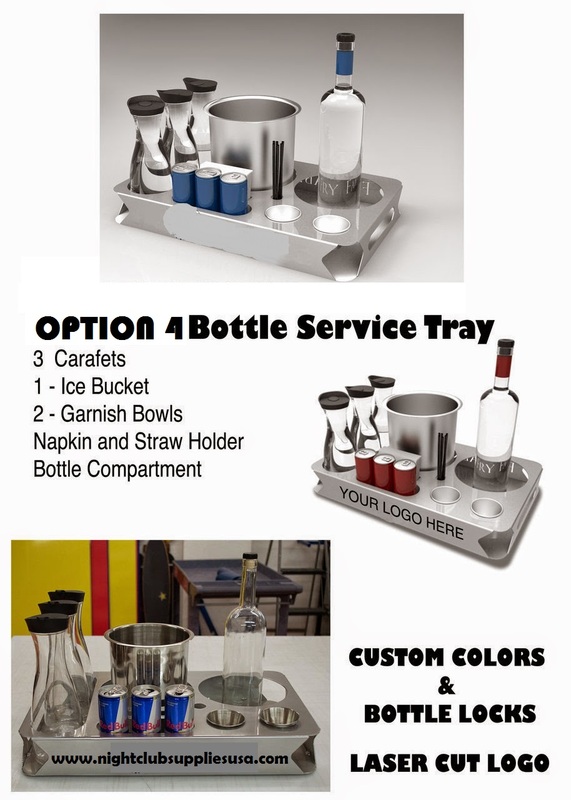 The OPTION 2 Tray is handcrafted out of powder-coated steel and allows for customization options to match your venue or brand's image or logo. 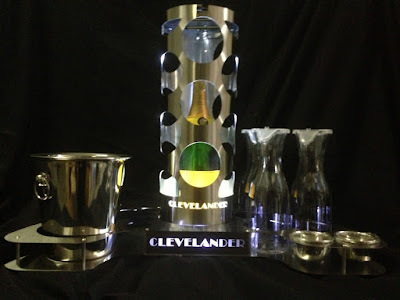 Our bottle service kits can be completely customized including custom logos, accessories, colors, and lighting. 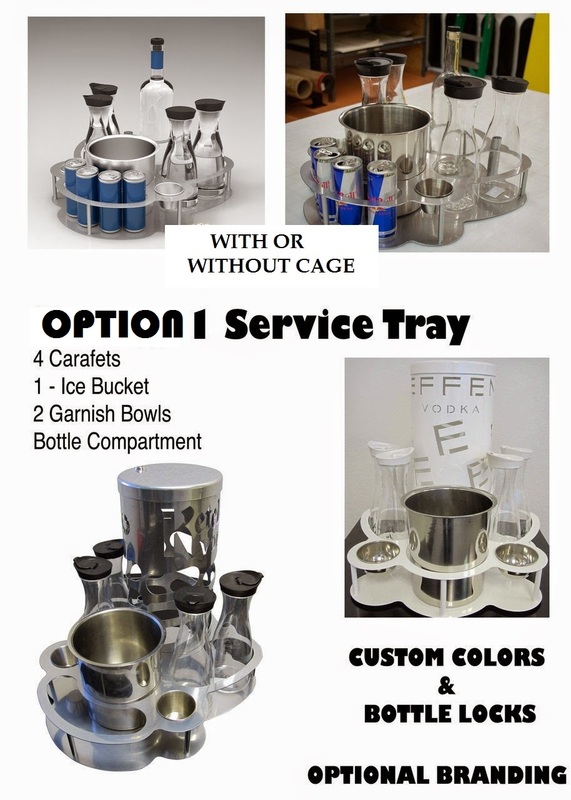 Designs are available in Locking and non-locking styles, and these Custom VIP Trays are made of high resistant steel, polished or powder coated colors. 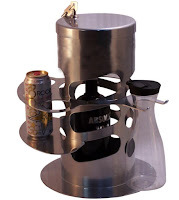 Included:(2) garnish cups, (2) 1L carafes and, (1) stainless steel ice bucket. The OPTION 3 Tray is handcrafted out of powder-coated steel and offers a large area available for branding. This is smaller than our other trays but still carries its own making it very convenient for smaller spaces. 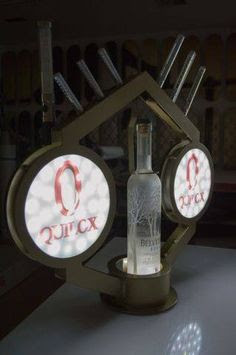 Our bottle service kits can be completely customized including Laser Cut custom logos, accessories, colors, and even lighting. The OPTION 4 tray is our largest of the ENERGY Line trays. The side by side Bucket/Bottle Openings give you more room to get creative and fit more on board. 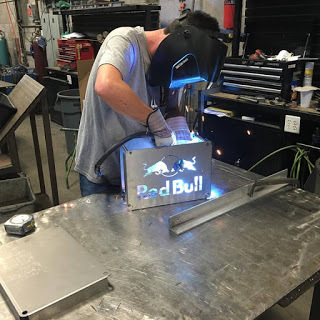 It is handcrafted out of powder-coated, rolled steel. Our Nightclub Supplies USA Custom Shop bottle service kits can be completely customized including custom logos, accessories, colors, and even lighting. This one of a a kind LUXURY bottle Presenter, or Bottle Carrier is made for the Bottle Service Elite Team to deliver to customers that want to make a statement. The tray will have a Logo illuminated on each side, as well as a bottom Bottle Glorifier to light up clear bottles and the surrounding area on the bottom of the bottles. This VIP Bottle Presenter is the Elite of the Elite in Bottle Service Presentations and is designed to carry and execute flawlessly 3 different products that bring to life Bottle Service Delivery. 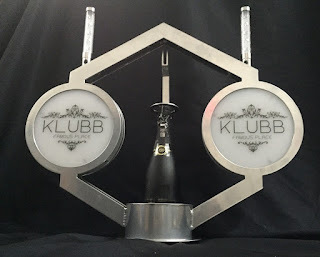 It works with regular and traditional Champagne Bottle Sparklers, it also will hold LED NITE SPARX LED Electronic Champagne Bottle Sparklers, as well as the famous LED STROBE BATON, having a holder on each side. 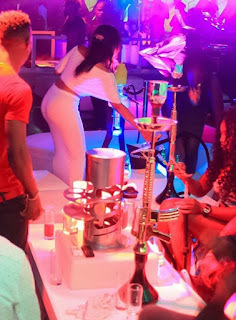 SEE BELOW PICTURE!! 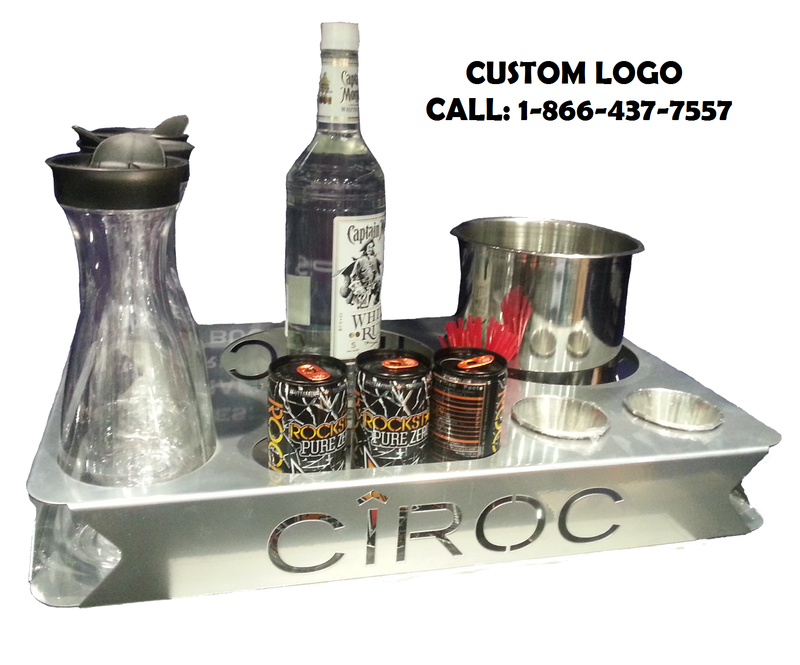 Custom Manufactured - VIP BOTTLE SERVICE - Delivery Trays, Customized VIP Bottle Presenter and LED glorifier Trays, For your Nightclub, bar, or lounge. 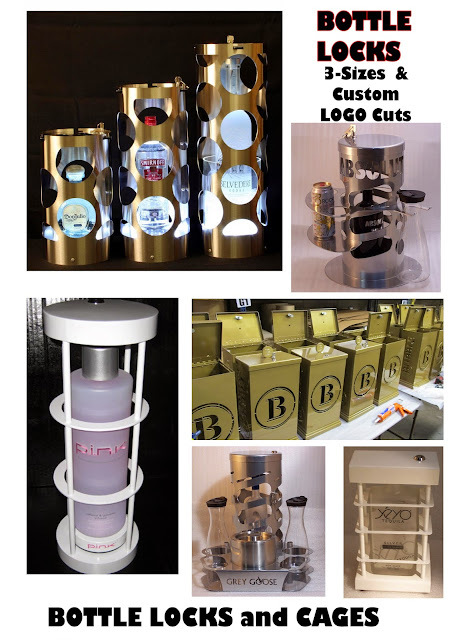 Check out Nightclub Supplies USA's VIP BOTTLE PRESENTER" With YOUR LOGO, New Batches are always in production meet demand. 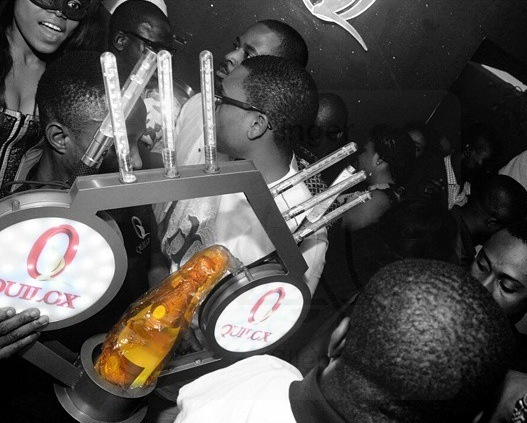 The Traditional sparkler or LED Sparklers as well as LED Strobe Batons Headlights your LOGO by adding a flashing show. We carry many more Custom Trays and Bottle Service Trays. 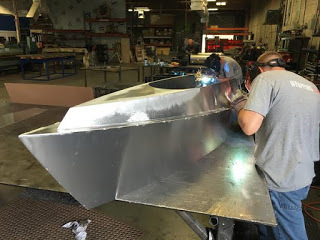 We can even design one for you. It can be a presenter or a locking cage! It holds 5 energy Drinks, 4 Carafes, Garnish bowls, shaker, Ice Bucket, LED Bottle Light, Lockable Cage(See picture below) It has side open handles, and removable customizable Face Plate with magnetic fastener. 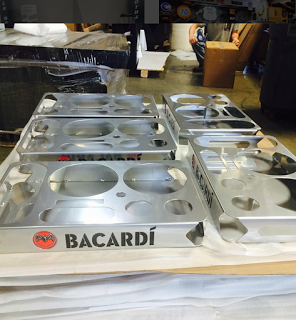 THESE VIP BOTTLE SERVICE TRAYS WERE DESIGNED BY OUR TEAM, ACCORDING TO OUR CUSTOMERS REQUEST AND NEEDS. 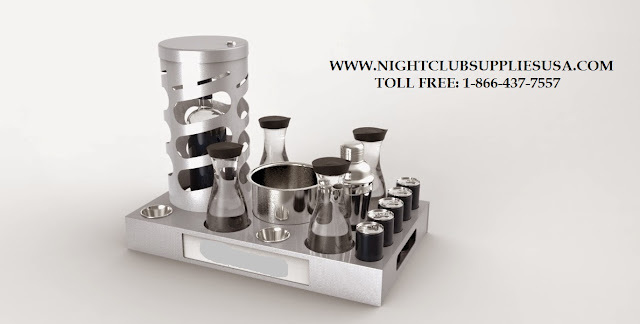 THE BOTTLE SERVICE TRAYS ALSO HAS A STAINLESS STEEL SHAKER FOR MIXING DRINKS AS WELL AS SPACE FOR 5 ENERGY DRINKS. 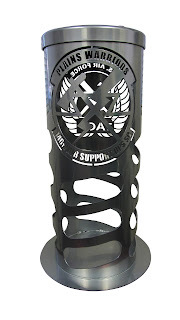 ANOTHER FEATURE THAT WE ADDED WAS A LOCKING BOTTLE CAGE / LOCKING BOTTLE LOCK.THESE BOTTLE LOCKS CAN EVEN BE CUSTOM DESIGNED WITH A LASER CUT LOGO ON THE BODY OF THE CAGE. THIS NAME CHANGER FEATURE LETS YOU SLIP IN AND OUT DIFFERENT INSERTS WITH DIFFERENT TEXT OR GRAPHICS, THEY CAN PUT THEIR CLUBS LOGO, OR THE CUSTOMER/COMPANY NAME ON THE FRONT. 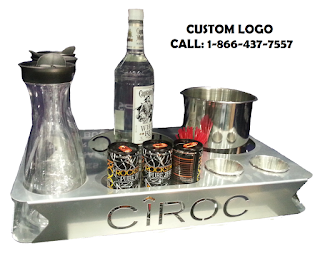 Oversize CUSTOM Bottle SERVICE Tray For bottle service!! 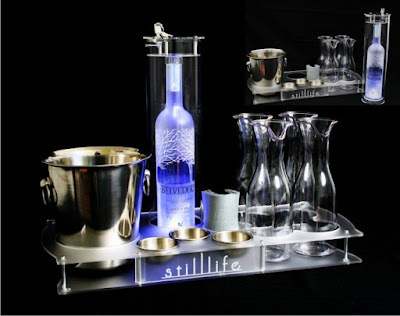 Our Bottle service tray LINE Custom VIP Bottle Service Trays are very good quality workmanship as well as durable. 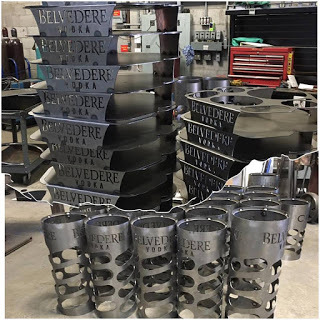 They are made per order and some we pre stock for fast shipping. 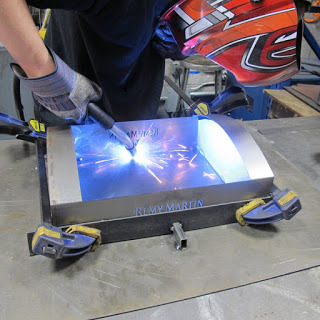 All Custom orders with Laser Cuts take approximately 10 -12 Business days!! 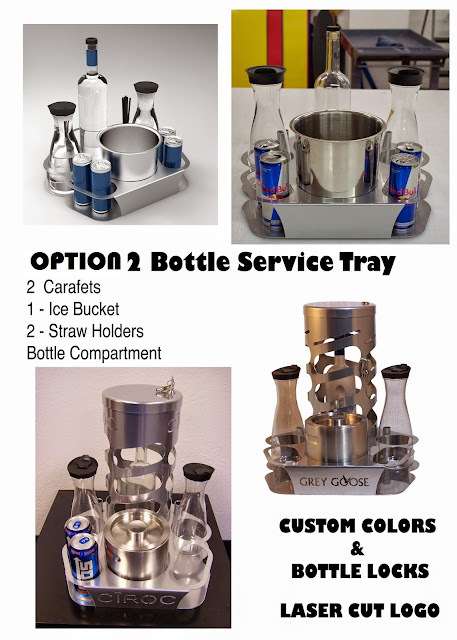 Take your Nightclub and VIP service to the next level and really have your Bottle Service Delivery stand out with these high quality and impressive Bottle service trays.